Laid down in August 1858, at Portsmouth Navy Yard, N.H. Participated in the bombardment of Fort Walker at Hilton Head, S.C.
Recommissioned, 7 October 1864, for assignment to the North Atlantic Blockading Squadron off Wilmington, N.C.
Decommissioned, 3 April 1868, at Mare Island Navy Yard, Vallejo, CA. CSS Huntsville, Commo. 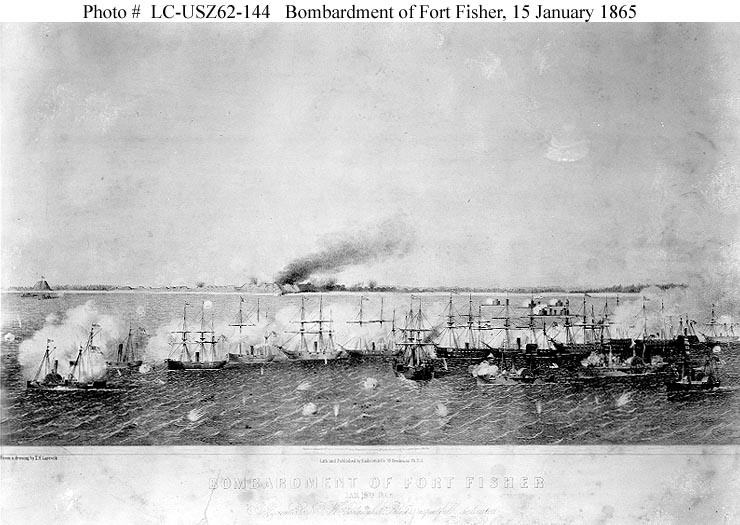 Tattnall, (probably misidentified as no record exists that CSS Huntsville served in the defenses of Port Royal, S.C.
94k "Bombardment of Fort Fisher" "Jan. 15th 1865"
USS Malvern (Flagship of Rear Admiral David Dixon Porter).